Don't go alone. Take this tech. Are you heading on a road trip in the near future? Road trips can be fun, but there’s some great tech out there to help make them both funner, and easier. The right gadgets can make a world of difference - from ensuring your phone is nice and charged up to making sure that your coffee never goes cold. As we hit the highway on The Road to CES, here’s some of the best road trip tech out there that will make your trip smoother and, we hope, more enjoyable. Whether you want to capture every moment on the road or simply have a record of any accidents or other legal issues that could arise, the Garmin Dash Cam 65 is among the best dash cams on the market. The camera boasts a 180-degree field-of-view, along with a 2.1 megapixel sensor, forward collision warnings, and even a GPS under the hood with automatic incident detection. 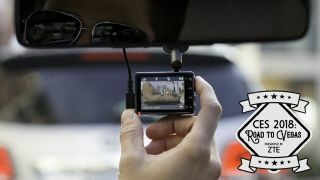 It even offers voice commands to allow you to start and stop recording without having to take your hands off the wheel. Your phone’s data plan can be very helpful on the road, but what if you want something a little more substantial that you can use with multiple devices? Then perhaps a mobile hotspot, like the AT&T Netgear Nighthawk Hotspot LTE, is for you. Using the hotspot, you can create a Wi-Fi network on the go, which you can use to connect things like your laptop, Nintendo Switch, and phone to the internet. The device displays how many devices are connected, and how much data you’ve used too - so it’s easy to keep tabs on things while you’re using the data. Long road trips can drag on ... especially if you run out of juice on your phone or other gadgets. Thankfully, there’s a device to help prevent that - and it fits nice and snugly in your car’s cup holder. The EasyFocus Car Power Inverter gives your car a few charging ports that may be more useful than the cigarette lighter-style ports currently in cars. With the device, you’ll get a standard US power outlet, along with two USB ports, and even another 12V car power output for other ports. It makes it pretty easy to keep your devices nice and charged up. Most people don’t own a smart car just yet, but thankfully it’s still possible to give your car some extra brains -- or at least give your phone access to the information the car does have. That’s thanks to an OBD2 Bluetooth adapter like the one from CellAssist, which, coupled with an app like Dash, allows you to monitor things like gas efficiency and distance driven. Perhaps more importantly, however, it could help you figure out exactly what’s wrong with your car should a dashboard light turn on. That’s thanks to the fact that it can check codes generated by your car in those instances against a massive database, so you can make sure what’s going on isn’t too serious - or at least prepare yourself for a quote from a mechanic. Many of us have data plans on our phones, but what if you want a slightly more comprehensive mobile network on the go? Thankfully, the HooToo wireless travel router is here for those situations. While a device like this won’t magically create a broadband internet connection, it will allow you to share data from your phone’s connection on the go, turn wired networks in hotels to wireless ones, and even share data between different devices. To achieve those goals, the device has a built-in 10,400mAh battery, charging ports, and an Ethernet port - ensuring that you remain connected at all times you possibly can. While your OBD2 Bluetooth adapter may tell you why your car has broken down, it won’t be able to fix your car for you. Being broken down on the side of the road can be a dangerous situation, and alerting other drivers to your whereabouts can make a big difference when it comes to safety. That’s what these LED “road flares” are for. The flares are basically puck-shaped lights that you can turn on and set on the side of the road. Unlike standard flares, however, these use batteries that can power each light for up to 36 hours, after which you can replace those batteries to keep using the lights. That can be pretty handy, especially if you have an older car and anticipate more than one breakdown. We’re heading into an age of virtual reality, and what better way to relive the experience of your awesome road trip than to film it in 360-degrees. We think that the Samsung Gear 360 is among the better 360-degree cameras out there, thanks to its portable size, and high-quality sensors, which sit in at 8.4-megapixels each. The Samsung Gear 360 also has an accompanying Android app, which you can use to edit, view, and share your 360-degree videos while on the go. Some prefer to use a car mount or simple voice direction, but not everyone likes voice navigation or having to glance away from the road while driving. If that’s you, then perhaps a HUDWAY heads-up-display is the way to go. The display is a little less high-tech than you might think. It basically uses glass to display a reflection of your phone’s screen in front of you, so you can see things like a map displayed over your car’s glass. It’s a pretty cool solution, and a way to put a map to your destination in a much more accessible location. GoPro has become near synonymous with the action cam and for good reason. The company offers extremely well-built, high-quality cameras that will help you capture great video in almost any situation. The latest in its lineup is the GoPro Hero 6, which will allow you to continuously capture great footage, whether you’re in the car, skiing, or even skydiving. DJI has built quite a name for itself in the drone business, and its latest offering, the Mavic Pro Platinum, lives up to the DJI name. The drone offers 10% longer battery life than its predecessor, and flies quieter too, which is always good news. Thanks to the upgrades, the drone will be able to fly for up to 30 minutes, which is really pretty good - and helps make it a great choice for recording footage on the go. The camera on the device is able to capture footage with up to a 4K resolution, and it’s one of the best DJI has included on a drone to date. The device also boasts DJI’s autonomous flight modes, which are pretty smart and should help avoid any collisions. While going new places can be a lot of fun, actually getting there isn’t always so. In those situations, a Nintendo Switch can seriously help pass the time. The Switch is Nintendo’s latest and greatest gaming device, and it blends the company’s consoles and handheld systems into one -- essentially meaning you can enjoy the console-quality games on the Switch, on the go. There are a few awesome games currently available, but standouts include The Legend of Zelda: Breath of the Wild, and Super Mario Odyssey. Brought to you in association with ZTE - follow along as our intrepid editors Matt Swider and Nick Pino road trip across the US to CES 2018. They're testing out the latest tech along the way, and you can keep track of their journey on The Road to the Show 2018 liveblog. Plus, we've got even more great tips on how to plan your next adventure.